Invited by the Qingdao International Standardization Forum, CENELEC President, Dr. Bernhard Thies visited China and delivered a keynote speech of the “Standards make cities smarter” in the forum on 28 June 2017. In the speech, Dr. Thies firstly introduced the unique standardization system in Europe for the audiences. After indicated the role of standards in smart city, he elaborated on the development of smart city standardization in Europe: CEN, CENELEC, and ETSI jointly established the CEN-CENELEC-ETSI Sector Forum on Smart and Sustainable Cities and Communities to provide advisory and coordination for the cause; to meet the requirements of European industry in the adoption of a wide range of innovative and digital technologies, CEN – CENELEC has adopted a Strategic Plan for Digital Transformation, which was carried out by the implementation of oneM2M project, as well as close cooperation with Alliance of Internet of Things Innovation and ISO/IEC JTC1. Last, Dr. Thies analysed the challenges in front of smart city industry, and proposed suggestions for its future development: to build up an architectural model to help identify where to start, to develop a roadmap to help implement the standardization, and the standards developed help cities provide smarter and sustainable solutions to meet the global digital and sustainability challenges. 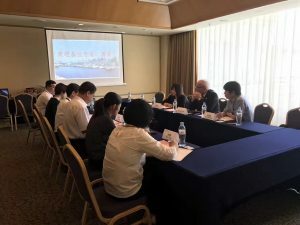 In the afternoon, Dr. Thies had a meeting with representatives from the Qingdao Quality and Technology Supervision Bureau and the Qingdao Standardization Institute, who were also the organizers of the forum. The both parties exchanged views on the issues of common interest, such as personnel exchange and training, SME’s participation in standardization, and standardization in Internet of Service. The Seconded European Standardization Expert in China (SESEC) provided support to the activities.